For her consistent and fearless fight over the years for her peoples independence and dignity. Her work for human rights and co-existence with the state of Israel has won respect in all camps. She is a leading force in the struggle for increased openness and democratic structures within her own Palestinian ranks. 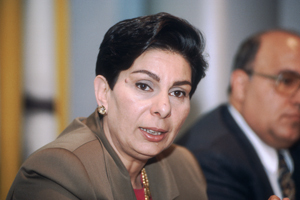 Hanan Ahrawi is an inspiring symbol of a new, democratic, peaceful Middle East.